1. Brush insides of butternut squash halves with 2 tbsp. extra virgin olive oil. 2. Season the insides of butternut squash halves liberally with kosher salt and sparingly with freshly ground black pepper. Place a sprig of rosemary on each butternut squash half. 3. Place all halves on an oven sheet tray, flesh side up, and roast in a 375 Degree oven for 35-45 min, or until tender. Allow squash to cool and scoop out flesh. 4. While squash is roasting, heat canola oil in a hot pan. add diced onions into the hot pan. Season with salt, and cook the onions until they are dark brown and caramelized. 5. In a large bowl, combine scooped butternut squash, grated Parmigiano reggiano, caramelized onions, and amaretto cookie crumbs. Season with salt and pepper, to taste. Mix well. 1. Place Eggs, flour, and extra virgin olive oil into an electric mixing bowl and turn on low speed for 1 minute. 2. Increase to medium speed and add water, if necessary, in order to allow flour and eggs to combine and form pasta dough. Continue to mix dough for an additional 4 min until pasta dough becomes somewhat elastic. 3. Round the dough with your hands and cover with plastic wrap. Allow to rest for 35 min. at room temperature. 1. Add butter and sage to a small sauce pan. 2. Turn heat to medium-low and allow butter to cook until lightly brown specks form at the bottom of the pan and the butter develops a strong nutty aroma. 3. Immediately take off the heat as to prevent butter from burning. Discard sage. 1. On a floured surface, roll the pasta dough out as thinly as possible (preferably with a pasta rolling machine). 2. Cut the pasta sheet into two equal-sized pieces and brush one of the pieces fully with egg-wash.
3. Using a tablespoon, scoop out equal amounts of filling onto the pasta sheet that has been brushed with egg-wash. Space filling-mounds roughly 2 inches apart from each other and fully cover this sheet with the second pasta sheet. 4. Use your fingers to press the second pasta sheet over the egg-washed one to release any air bubble around the filling and to seal the sheets together. 5. Cut into ravioli using a ravioli cutter and transfer to a floured sheet tray. 6. 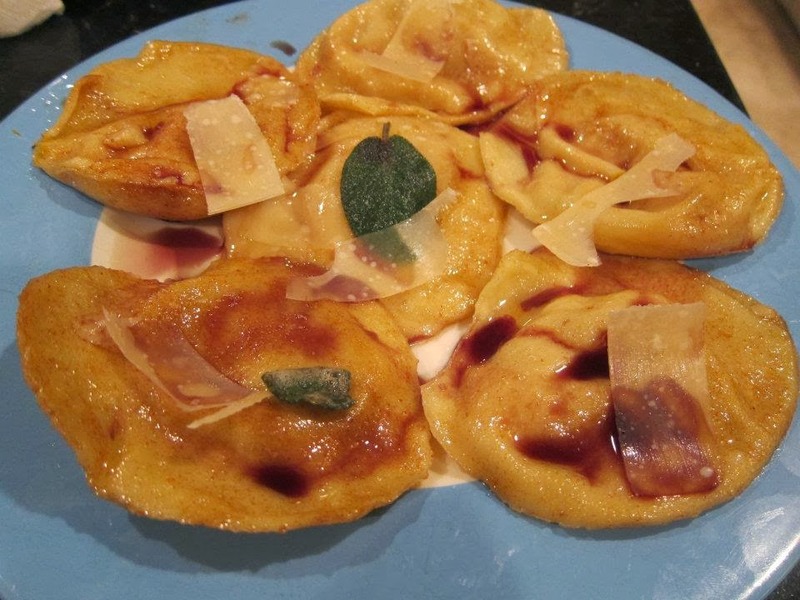 Cook Ravioli’s in salted boiling water for about 4 minutes, and with a slotted spoon transfer them to the pan with the brown butter sauce on med-low heat just to reheat the sauce. 7. Serve with flaky slices of Parmigiano reggiano and enjoy!